The answer is no - they are easier to care for than our cat. Aside from the initial expense of a place to live and the feeding and watering containers, food costs anywhere from $12-20/month (ranging from the feedlot gourmet to organic no soy layer mash), they are not expensive either. We are getting 20-27 eggs a week out of the four girls, which is more than enough eggs for the two of us. In my experience, chickens take care of themselves. The great benefit to having chickens inside the city limits is that fewer raccoons wander around the urban jungle wanting to eat them. I have several friends outside of town who “loseâ€ chickens on a regular basis courtesy of hungry raccoons - which is upsetting from a cleaning standpoint and a financial one. Horror stories are shared of being awoken in the middle of the night by a ruckus from the coop. One investigates to realize a raccoon snuck into the coop and is eating a chicken for dinner. When faced with such a scene - most of the people I talk to say they go back to bed and let the raccoon do what he does. Given the alternative - cornering a potentially rabid animal at 2 a.m. in the dark - I would probably do the same thing. Though there are more predators in the country, there is also more space for the chickens to wander. One can have roosters and the fertile eggs that result. With more space for chickens one could have varying ages as well - chickens lay regularly for the first two/three years and then their fertility starts to diminish. The eggs are bigger, but laying happens less frequently. Outside of the city limits one could cull the older chickens, turn them into soup, and allow a brooding hen to hatch the fertile eggs to have new stock join the flock. If the fertile eggs turned out to be roosters, one could cull those as well. Few farmers will accept hens past their laying prime or extra roosters, and it feels wasteful to kill a bird and bury it when I have happily munched on fried chicken in the past. 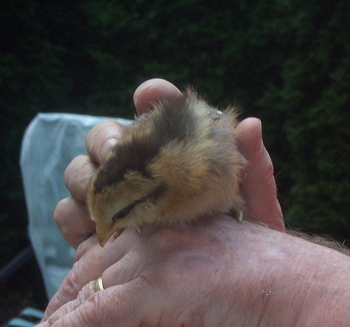 The decision we need to make next year is whether it will be time to introduce new baby chicks to our backyard and cull the girls we have lived with for the last two years. 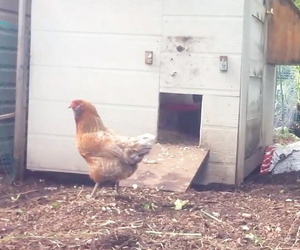 If we lived in the country we could let them live, but with the number of restrictions for backyard chickens in the city, that is not possible. Culling our girls involves taking them outside of town to a willing farmer friend and doing the final deed. As I think about that prospect, my belly twitches. Next time I teach a class on backyard chickens I am going to make sure to include this piece of advice. Don’t name your backyard chickens if you plan on eating them.